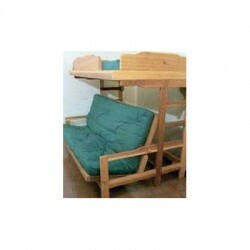 Create this multi-functional Futon Bunk Bed for your home or dorm. Simply pull two pins and the lower sofa seat will lay down to form the main, full size mattress bed; the single size mattress bunk above is fixed. You can disassemble this space-saving piece of furniture quite easily — the two ends stay intact, then the top portion and lower bed assembly simply lift off to form four separate pieces to move. Ample sleeping space for two to three — its a perfect inexpensive space saver for college students. Requires Full size and single size mattresses.